Hodges Badge Company, Inc. opens new manufacturing Facility in Washington, MO. PORTSMOUTH, R.I. (October 9, 2015) – Rick Hodges, President of Hodges Badge Company, announced the opening of their new manufacturing facility in Washington, Missouri today. The 82,000 square foot building consolidates all of the firm’s Missouri activities under one roof for the first time in many years. Hodges previously operated from two separate buildings elsewhere in Washington Missouri. Speaking at the grand opening celebration today, CEO Rick Hodges and General Manager Jolyn Maune praised the hard work of the Hodges team and of all the contractors who worked to make this day possible. In particular, Hodges thanked Washington Engineering and Architecture for their design work, Lewis & Associates (Project Management) and Sieve Contractors (steel and metal building work). The project was financed by the Bank of Franklin County. Mr. Hodges stated that the company currently employs 65 people in Washington, a number that is expected to rise in the coming years. In fact, the company is looking for new employees in both Rhode Island and Missouri. This new building includes facilities for Customer Service, rosette and ribbon manufacturing, engraving, and trophy production. Medals will also be added to the lines produced in Missouri in 2016. 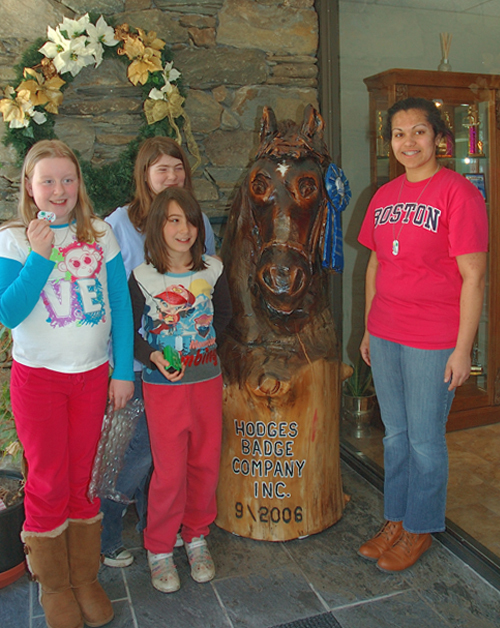 About Hodges Badge Company, Inc.
Hodges Badge Company, Inc. is the country’s leading manufacturer of quality custom awards. The company manufactures custom award ribbons, custom rosettes, medals, plaques, presentation silver, crystal, badge ribbons, sashes and buttons. Founded in 1920 by William F. Hodges, Hodges Badge Company, Inc. is headquartered in Portsmouth, Rhode Island, with manufacturing facilities in Rhode Island and Missouri. The company employs 100 people in Portsmouth, RI and 65 people in Washington, Mo. The company sells its products via catalogs and the Internet. Primary markets include equestrian events, dog shows, fairs/4-H, swimming, gymnastics, and schools. Today’s students are involved in a wide variety of activities in and out of the classroom. They participate in Spelling Bees, athletics, reading contests, clubs, and Science Fairs to name just a few. There are also many classroom opportunities to celebrate success and accomplishment every day. A simple, budget friendly recognition program can provide the tools needed to encourage achievement and motivate students to perform at their highest level – while still having fun. Rewarding students for positive contributions and achievements builds self-esteem and confidence. With feelings of confidence come positive behavioral choices immediately apparent to teachers, school administrators, and parents alike. 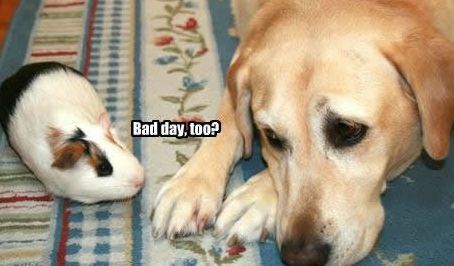 Sometimes a well-timed “excellent!” or “good job!” is all that is needed. Academic excellence – Celebrate specific milestone accomplishments in Reading, Writing, Science, and Math. Students who show extraordinary scholastic achievement deserve recognition along with students who are working hard to improve their grades. Classroom participation – Maintaining a high level of classroom participation can often be a struggle. Simple classroom participation ribbons are a great way to get students excited about participating in class. If they are participating they are learning! Spelling Bee – The Spelling Bee is a traditional competitive event where there can be many winners. Consider participant awards for all of those students that participated in the event. Adding your school identification to any award makes the award important and special. Citizenship – Recognize students with all around good behavior, manners, and respect for others. A most worthy award! Attendance – Good attendance should be rewarded at end of year award ceremonies but also consider using attendance awards more frequently during the school year. Try a monthly attendance award. Student of the Month – Create your own Student of the Month Award to reward students exceeding your expectations. Leadership – Reward the students that provide leadership for classroom projects and activities. End of the year award ceremonies – All students have unique abilities and interests and it is important that their individual qualities are recognized at end of the year award ceremonies. From an award for “Being on Time All the Time” to “Always Completes their Homework” to the “Mad Scientist” award (most creative with their Science experiments), these rising stars all need a pat on the back. What Types of Recognitions and Awards Should You Give? There are many factors to be considered when choosing the right recognition program for your school or classroom, including: What milestones or behaviors do I want to reward? Do I want my recognition awards customized with school logo and personalized messages? How do I get the most value on a limited budget? The following is a list of recognition award solutions to help you make the right choice for your program. Ribbons and Ribbon rolls – Kids love ribbons! Ribbon rolls are one of the most cost-effective choices teachers and school administrators can make to reward students. A teacher or principal can easily store hundreds of customized ribbons on a single ribbon roll and just cut them off the roll to award students as needed. Ribbons and ribbon rolls are make great on-the-spot awards – economical and easy to use when you want to reward a student immediately in class. Customized ribbon rolls can be printed with your school logo and your own personal achievement message. Buttons and pins – Buttons and pins are another economical way to appreciate students for a job well done. They are also a preferred choice for building school spirit. Why not hand all students a button customized with the school mascot to display their pride at major athletic events, musical performances, or even to welcome them back to school. Any school sponsored activity can be acknowledged with personalized buttons, giving students who wear them a feeling of belonging and pride. Medals – Medals are an exceptional way to recognize a student who has achieved a great milestone or goal. They are typically given at award ceremonies where a student is called upon to take center stage before his peers and be recognized for academic or athletic excellence. Dog tags – Dog tags are the hottest trend! Kids love wearing customized dog tags on chains and using them as key chains. Customized dog tags provide a unique way to recognize students and give them a sense of pride and honor when participating in school activities and athletics. They are a great choice for recognizing individual or team accomplishments. Plaques and trophies – Plaques and trophies are the traditional recognition awards preferred for End of the Year Awards ceremonies. These are awards students will cherish for a lifetime and frequently are displayed on a student’s bedroom shelf or hang on their wall as a constant reminder of their achievements. Recognition and award programs can have a major impact on academic performance and are easy to implement, especially in K through 4th grade classrooms. All students have a need to be recognized for jobs well done. Confidence soars, grades improve, school pride escalates, and students are primed for continued success throughout their educational careers. After all, who couldn’t use a little recognition for a job well done every now and then? 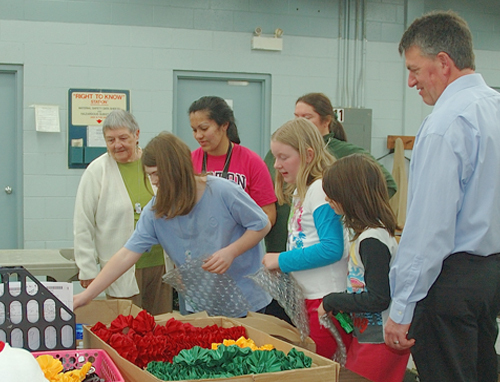 This morning we were the lucky hosts to members of the 4-H club from Franklin, Connecticut. 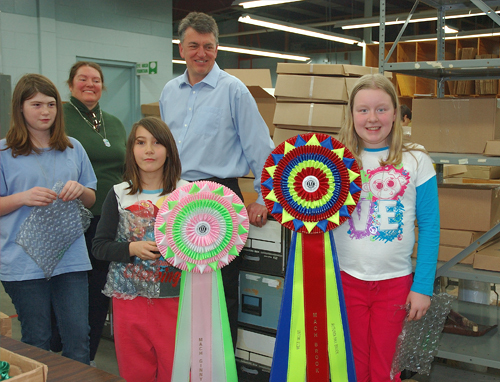 After earning a few of their own ribbons, they took a field trip to visit our Rhode Island factory and see how awards are made. Standing with our Holsworthy rosettes- they were almost as big as the girls! Posing with our Hodges mascot after the tour. Are you part of a school, equestrian, 4-H or community group that would like to tour or Rhode Island or Missouri facilities? Let us know and we’ll be happy to work something out! It’s about the time of year when students look forward to a very special day– Field Day! If you haven’t yet planned for your Field Day awards or takeaways, don’t worry. We’ve compiled a list of suggestions that should fit the bill. 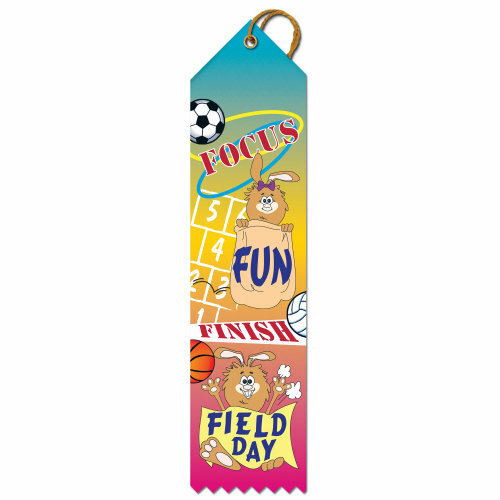 The “Focus, Fun, Finish” Field Day ribbon, our Field Day Ribbon Roll, and our Field Day Award Ribbon are all Quick Ship items, which means they ship in 24 hours when you call in your order, and in 72 hours when you order online. 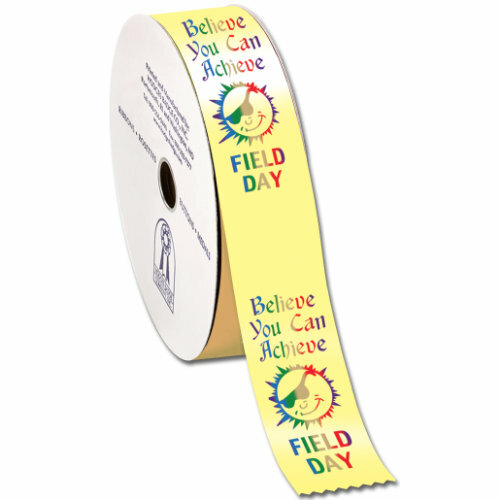 The 100 yard Field Day Ribbon Roll gives you six hundred 2″ x 6″ ribbons, which equals out to cost less than 10 cents per ribbon. Of course, custom ribbon rolls are also a popular choice. Many schools also choose our Star or Torch Award Ribbons which come in first through sixth place, and also have a Participant award. Need to advertise your event? Our new lower-priced banners will hold up outdoors and help you get the word out. Lastly, we hope everyone (students and teachers alike) enjoys their special day. Don’t forget the sunscreen! Have you bought or sold awards on ebay? It recently was brought to my attention that new, unused rosettes had been offered for sale in several online auctions through ebay. While it turns out that a show was selling their unused ribbons as part of a charity auction, the scenario still made me wonder- would you buy or sell previously awarded ribbons or rosettes on ebay? Sure enough, looking on ebay, there are plenty of ribbons for sale, both new and vintage, from single Grand Prix championship rosettes to lots of 50 smaller and simpler ribbons. I understand that a quilter might be using these ribbons as material for their craft, or a decorator might be interested in the vintage rosettes for an artistic endeavor. And we would never claim to have a say in what happens to our awards after they are shipped out the door. But who is scooping up these lots of ribbon for $1 or $2? Maybe someone running a therapeutic facility snatches up the awards at a low cost. Have you sold off ribbons on ebay to prepare for a move or clean out your child’s closet? We’re honestly just curious. Let us know of your experiences in the comments.